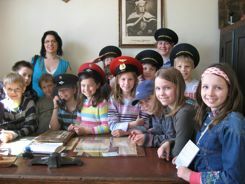 Independent travel or group tours? Which one is for you? Maybe you've looked at tour groups during your trip planning and decided that you really want to be independent. How independent? You don't want to be herded around. You want to sleep in when you want..
And where you want. Maybe in a small botique hotel or a B&B where groups won't fit. Just sit on a beach. Then independent travel is a great way to go. Or make hotel reservations for every day. You can just arrive and find accommodations as you go... or you can make reservations for the first night or two then start finding your accommodations for the rest of the trip. It takes less advance trip planning if you decide to find accommodations as you go, but some people don't like the stress of finding a hotel every night. Part of the process is deciding what works best for you. It takes less advance trip planning if you decide to find accommodations as you go, but some people don't like the stress of finding a hotel every night. Part of the process is deciding what works best for you. You can make reservations for the first night or two then start finding your accommodations for the rest of the trip. As an independent traveler, you can stay in small economical places that groups won't fit into. It may cost more to stay in larger hotels... group tour operators tend to get good breaks on those rooms. But you'll probably rub elbows with more locals in that small local place than you would in that big hotel. 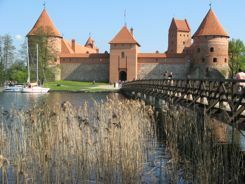 In Lithuania, we stayed in Trakai where our little hotel had a great view of Trakai Island Castle. Believe me, there was no place for a large tour group to spend the night. Our hostess was a champion rower. 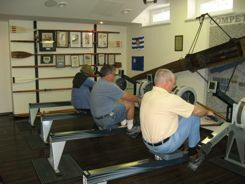 She trains the local team and has a great collection of all kinds of things related to rowing. We had a great time talking to her and even trying out the equipment... but only for a very short while. We were on vacation... not in training! Should You Reserve Museums From Home? You can use the internet to make reservations at museums and popular spots before you leave on your trip. My sister loves to travel this way. This means you'll be sure to get into those museums or other venues, but it also locks you in to a timetable. If you're feeling a bit more independent, consider making phone calls or using the internet to make those reservations on the road. You'll get English speakers on the phone; you'll probably still get the reservations you want and still have the flexibility of changing your timetable as you travel. Independent travel allows for more adventure and spontaneity. If you end up in a village that looked charming in the pictures... but there really isn't anything there for you... you can just move on. On the other hand, if you stumble on a great local festival, you can linger and enjoy it. 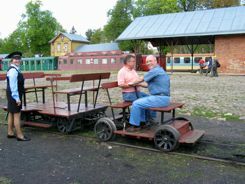 Sometimes you can let the little kid in you come out... or even interact with local kids like we did at this train museum. You never know what you might find out, and you could end up with a new friend! Rent A Car Or Public Transportation? It's easier for a couple and better still if you travel with friends to share the expense. But traveling with friends and family takes some planning of its own! If you're going to find rooms as you go, you all need to be comfortable with that. We have some travel buddies we go on driving trips... and we just never know where we'll end up. We have other friends we travel with when we take small group adventure trips... they just hate not knowing where they're going to sleep. So weigh you options, tour group or independent travel. Make all your reservations ahead or wing it? A large part of the joy of travel is the trip planning and anticipation... so plan it your way and enjoy the trip.